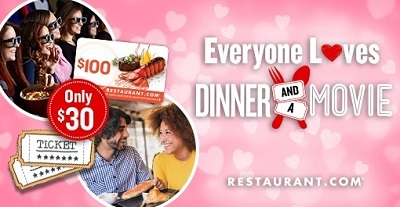 Fantastic Valentine's Day entertainment offer from Restaurant.com! Get 2 Movie Tickets plus a $100 Restaurant eGift Card for just $30. Plus earn 7% cash back on your purchase from Sunshine Rewards. This offer runs through 02/13/2019.